For most Sims players’ prolonged engagement with the Sims game, there’s a limit to how much that can be done with canon information alone, without bringing it into the the realm of fanon. CANON information are strict facts about the premade Sims characters and game mechanisms when they are first shipped with the game. Such background information, while limited and limiting, is useful to establish a context for players to “get to know” the unplayed characters and game phenomena. Once the players decide to develop the characters further, be it via strict gameplay or more imaginative storytelling, the characters cross into the realm of FANON — a player’s interpretation / development of premade characters / storylines. Even if the player rigidly sticks to the game developers’ backstory ideas / suggestions of how the characters “should” develop, the resulting narrative is still the player’s “fanon”, as this is only ONE of the possible approaches to the game. Players who remain overly focused on canon are more likely to have a rigid and stagnating approach to their simming experience. Fanon is NECESSARY for players to continue being interested in the game, so that canon information can “continue to remain useful” as an optional starting point. It is therefore a grave error to assume that Sims fanon is necessarily “inferior” to canon, because the Sims game’s appeal is NOT by facts alone. Similarly, one cannot expect to maintain a fresh interest in the sims game over a prolonged period, if one LIMITS their simming experience to canon information and rigid interpretations. It is a relatively “easy” and “dry” task to compile and / or vet a limited list of factual “canon” detailed information, as compared to the “difficult” and “creative” task of writing diverging narratives of engaging and original “fanon” storylines. Most people can do the former, but not many can do the latter. So a better use of time for those who CAN write engaging stories is to focus on developing their creative writing skills. To be clear, “engaging stories” are NOT simply a laundry list of details / facts about your Sims characters. In most cases, “engaging stories” are likely NOT limited to strict gameplay mechanics. In-game possibilities ALONE tend to be overdone among many Sims players, so it is harder to be fresh and engaging in the face of such limitations. Some canon “purists” cannot stomach the fact that the author of StrangeTown Monty (STM) took Veronaville out of its supposed “primary” Renaissance / Shakespearean context. In STM, Veronaville is ground zero of a scientific conspiracy that also involves Strangetown. In PVCS vs STM 2015 & 2035, the Veronaville Feud splits the neighborhood between two 21st-century style football/soccer teams. In these same set of stories, the STM author also “had the nerve” to refocus Veronaville on “Bianca and Kent” instead of on “Romeo and Juliette”. But if one thinks more carefully about this, the author’s demographic is more attuned to the former “unconventional young adult geeks / nerds” than the latter “typical teenage romance”. The author even dares to swap the aspirations of Bianca Monty and her brother Antonio, such that she is portrayed as a Knowledge sim, while he is more like a Family sim. The author believes that the game developers should have just made Bianca Monty a Knowledge sim to begin with, because among the Sims 2 Base Game female premade playable characters, Olive Specter is the ONLY one preset with the Knowledge aspiration. 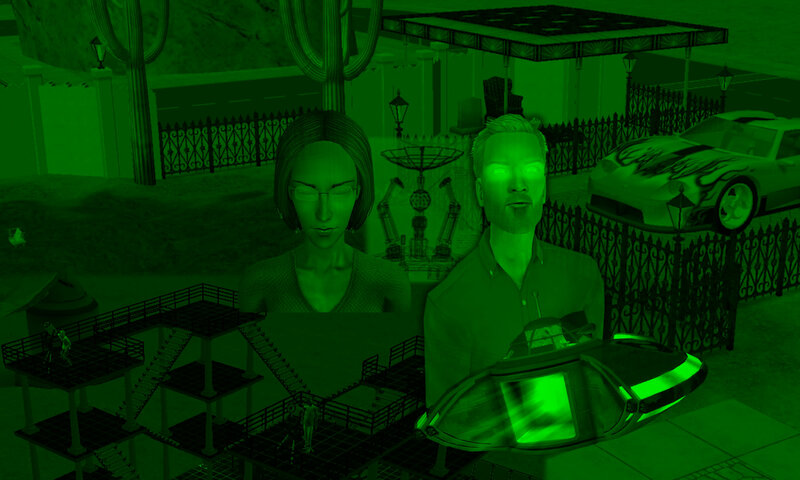 The author interprets Bianca as a open-minded and intellectual 21st-century woman, or “Knowledge sim who wants to be around other Knowledge sims”, which is the very reason why she instinctively chose Strangetown as her preferred home. This video parody was originally meant to be a joke about the Caliente sisters’ lack of alien genetics, in terms of strict gameplay SimPE data. So the author had to introduce some twists in the STORY, in order to explain the genetics of Dina’s baby. Dina Caliente’s baby son was not named in the original video. His name was only announced in the PVCS vs STM 2035 Match story, where teenaged Juan Caliente is a major character. The author is fully aware that Don Lothario is canonically NOT an alien. But for the sake of a fresh perspective in storytelling, he introduces “Colony Don”, an alien version of Don Lothario, who may or may not be the same character (in terms of storytelling) as the original human Don. As for Bella Goth, the “official gameplay suggestion” is that she was abducted by aliens via Don Lothario’s telescope, and somehow had her memories wiped before she was thrown into Strangetown. Yet “Strangetown Bella” may also be interpreted as a modified clone, or even an imposter. Some players also consider the alien abduction theory to be a cover-up for the “fact” that Bella was murdered instead (in their own stories). Whatever “really” happened to Bella Goth is completely up to the player’s imagination, as there is no right or wrong answer in storytelling. Both the Dina’s Baby Parody and the [Main STM] have a slightly different interpretation of what the author thinks happened to Bella Goth. This refocusing and re-adaptation is my way of opening new trajectories to a once-predictable path. Of course, fresh approaches may only succeed if they are accompanied by careful thought / planning, as well as discipline to complete the production. Storytelling, and even one’s interest in Sims, will be dead and monotonous if one INSISTS that the canonical predictable path is the ONLY correct approach. One is free not to like another simmer’s approach, but that does NOT make the other simmer’s story “wrong”. That is why I assert that all simmers have the right to have their own version of premade characters, and all versions are equally valid. The very essence of the Sims games is to CREATE your own stories about the characters, to keep your experiences with the Sims game fresh and interesting.